How do you find the correct engagement ring size? Don’t stress out, we’ll tell you all the tips and tricks to getting the measurement just right. If the ring does need to be resized, WorryNoMore®—it’s covered by Macy’s care and maintenance plan. Read on to find out more details to make your proposal perfect. 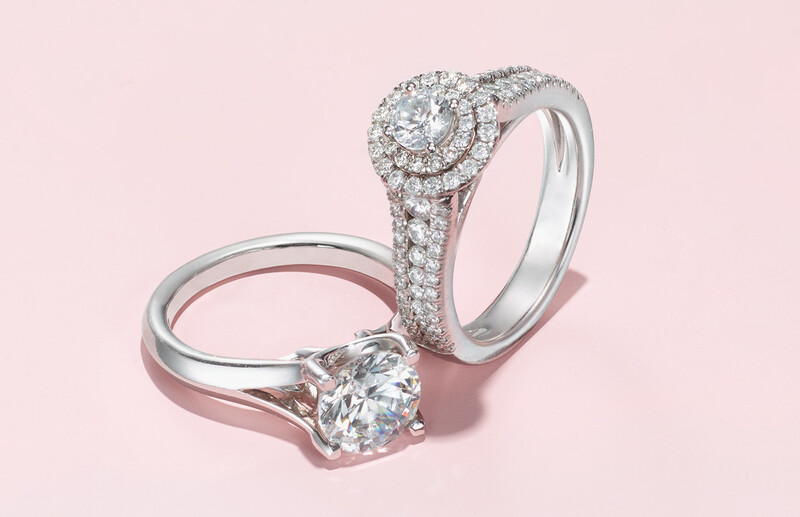 Shop sparkling designs from Marchesa, X3 and Macy’s Star Signature Diamond. The ring should fit snuggly yet comfortably on your finger. It should still be able to glide past your knuckle. You want to find the ideal fit, so the ring won’t squeeze your finger or fall off. How to Secretly Find Out Your Significant Other’s Ring Size? If you don’t want to ruin the surprise of the proposal, there are stealth ways you can find out your partner’s ring size. Take an existing ring of theirs to your nearest Macy’s store. When they’re not looking sneak a ring out of their jewelry box. Make sure it’s a ring that they wear regularly and still fits them properly—maybe avoid their high school class ring just to be on the safe side. Remember to tell the jewelry sales associate which finger your sweetheart wears this ring on, so the engagement ring can be sized up or down appropriately. Match one of their favorite rings to a circle below. The interior of the ring should fit exactly on the circle to determine the correct ring size. If the ring is in between two sizes, then you should size up. Ask their friend. When in doubt, always phone their best friend. They might know her/his ring size or they’ll be able to formulate a scheme to get it. Fun Fact: If you take their shoe size, divide by two and add three, you can get their ring size. Have your ring finger measured by a Macy’s jewelry sales colleague. For the best results, leave the measuring up to the professionals. Take the measurement towards the end of the day. Your fingers are generally smaller in the morning, so you want to take your ring measurement after your body has had a chance to warm up. Measure more than once. You should take your ring measurement multiple times just to be sure. If you’re in between sizes, you should go with the larger size. It’s easier to make a ring smaller than larger. And just remember, certain rings can’t be resized. What Do You Need to Know About Ring Resizing? Despite your best measuring efforts, you might need to resize your ring. And that’s no problem with Macy’s WorryNoMore® care and maintenance plan that is designed to give you peace of mind. However, not all rings can be resized, so let’s take you through the resizing process. What types of metals can be resized? If you decide on the below metals for your engagement ring, then you should not have an issue resizing your ring. Just keep in mind more complex bands might not be able to be resized. Silver. If you have cool undertones, then silver or white gold will look the best on your finger. Gold. If you have warm undertones, then go for the yellow gold ring. Platinum. This precious metal is stronger and more durable than gold. What kinds of rings can’t be resized? Unfortunately, some rings are more challenging to resize due their consistency. If you are considering any of the below rings, ensure your ring size is correct. Tungsten. Mainly used for men’s rings, tungsten can’t be sized. Titanium. The same is true for titanium rings, so be careful with your measurements. Eternity Rings. Since the band is composed entirely of diamonds, eternity rings are virtually impossible to resize. Generally, a ring can be resized up or down two sizes. You want to keep in mind that it’s easier to make a ring smaller than larger. Also, a simpler band will make the resizing process less complicated. Need a smaller ring? To decrease the size of the ring, the jeweler cuts a piece from the back of the band. Then, they create a circle with the existing band. Finally, the ring is soldered back together. Helpful Hint: Remember to ask the jeweler to give you back the piece of the band they cutout, just in case the ring needs to be enlarged in the future. Need a larger ring? When the jeweler has to increase the size of the ring, the metal can be stretched out to increase the ring half a size. Should the ring need to be made larger, it’s a more extensive process. The jeweler will have to cut the ring, then add in an extra piece. Finally, the ring is soldered back together like new! Women’s average ring size: 5 to 7. Men’s average ring size: 8 to 10-1/2.